A free and frank media is considered to be the real strength of any country. It is one of the most essential pillars of true democracy and thus comes the responsibility to ensure freedom of the press. It is the job of the media to point out the weaknesses and at the same time highlight strengths in society and governance. Therefore media houses must be away from any restrictions unless their reporting is against the public and the nation. Journalists and whistleblowers alike must be protected at all costs. However, there are many countries which lack the freedom to the press as their national policy or to ensure implementation of the various unpopular government agenda. Pakistan is one such country where the media houses and the journalists are expected to walk along the given track and any deviation could cost them the closure or loss of precious human lives. Pakistan’s nongovernmental Human Rights Commission of Pakistan (HRCP), a leading, rights watchdog had recently announced about the documentary proof of the ever growing restrictions on the freedom of media which is just “unprecedented”. In spite of Imran Khan the Prime Minister of the country promising freedom, surprisingly there is a startling decrease in individual and collective freedom of expression in 2018. 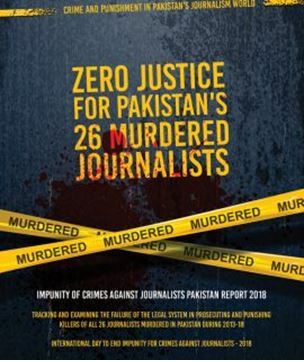 Since 1992, more than 65 journalists and people associated with various media houses have been killed in Pakistan, one of the highest in the world. Media coverage has been severely inhibited amid a climate of intimidation and fear, most specifically in reporting on abuses by government security and intelligence agencies as well as terrorists. In this intimidation and threats, the role of Inter-Services Public Relations (ISPR) the media wing of Pakistan Armed Forces, headed by DG ISPR, needs no explanation. Asking the media what to report, when to report and how to report is very common knowledge. Sometime back a concept of self-censorship by the journalists was implemented despite protests by the journalists and violators of such dictates were punished by blocking television networks and the distribution of newspapers attributing the act to the national security. There are frequent protests but the ruling government backed by all-powerful Pakistan military has been able to divide the media houses to dampen their efforts by patronizing few and even publically rewarding them. One such example has been the award of Pride of Performance to the ARY News journalist Arshad Sharif on Pakistan Day 2019, who was the first reporter on ground at Jabba top to cover the Balakot bombings on terrorist training camps by Indian Air Force on 26 Feb 2019. The authenticity of his reporting was however questioned by many as to how he managed to reach the spot on the same day even when DG ISPR, Major General Asif Ghafoor showed his inability in a press conference, to take the reporters to the bombing site due to bad weather. Diplomats and foreign reporters were only allowed recently to visit the place almost after about 40 days of the incident. Some other examples of media intimidations are the case of Cyril Almeida a leading columnist for the newspaper Dawn, who was charged for treason in bringing out facts harmful to the Pakistan Army and the Inter-Services Intelligence agency, during his interview with former Prime Minister Nawaz Sharif. The later had accepted that the Pakistan Army had aided the terrorists who carried out the Mumbai terror attack in 2008. In another incident, many media houses were pressured into firing certain employees. In the HRCP report “The most commonly tabooed subjects cited were: missing persons, the Pashtun Tahafuz Movement (PTM), Baloch separatists, and rights activists”. The report also mentions about the routine advice, from Pakistani civilian and military bureaucrats responsible for public relations to the media houses on their reporting. In some cases, agencies have threatened for suspension or closure. It is a different story that Maj General Ghafoor has rejected imposing any such restrictions on the media. The killing of so many journalists in the past yet has no effect on the government who is least bothered about the safety of the scribes. No doubt, why Pakistan is considered one of the most dangerous countries for journalists? Pakistani journalists face censorship, beatings, threats, disappearances, and illegal confinements. Worst was the harassment meted out to Maryam Hassan, who had edited the report of “Annual State of Human Rights in 2017”, whose house was burgled. Later, it was established by police that it was more than a burglary. To add to the existing problems of media, the Pakistan government has now come out with a new Pakistan Media Regulatory Authority, or PRMA which is bound to impose further restrictions on the media houses. The brainchild of the current Federal Minister for Information and Broadcasting Fawad Chaudhry, media people feel that the proposed PMRA would usher in an era of heightened government control and censorship. The proposal has somehow been able to unite the fractious Pakistani media and they are vehemently opposing it. A good change and hopefully this unity will help media prevail upon the authorities to ensure real freedom for all the stakeholders.